Before opening Rockwall Chiropractic, Dr. Payne worked in an injury clinic. There, he saw many pre-and postsurgical cases, auto accidents and traumas and learned how to rehabilitate even the most severe of injuries. When he’s not helping patients, Dr. Payne spends time with his wife Brittnee and their two children Colton and Sydnee. They enjoy family outings, going to fairs, carnivals and events around Rockwall and vacationing to ski or relax on a beach. Dr. Payne plays for the Rowlett USSSA softball team and enjoys golfing. He stays active at Planet Fitness, conveniently located just two doors down from our practice. He’s been involved with coaching his son’s soccer team for Lake Pointe Church and is a member of the American Chiropractic Association. 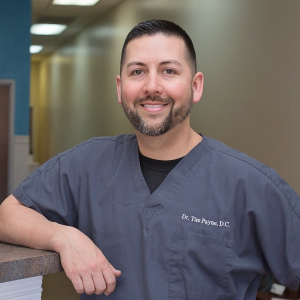 Schedule your time for a complimentary consultation with Dr. Payne. He’s an in-network provider with most insurance companies and accepts Medicare.